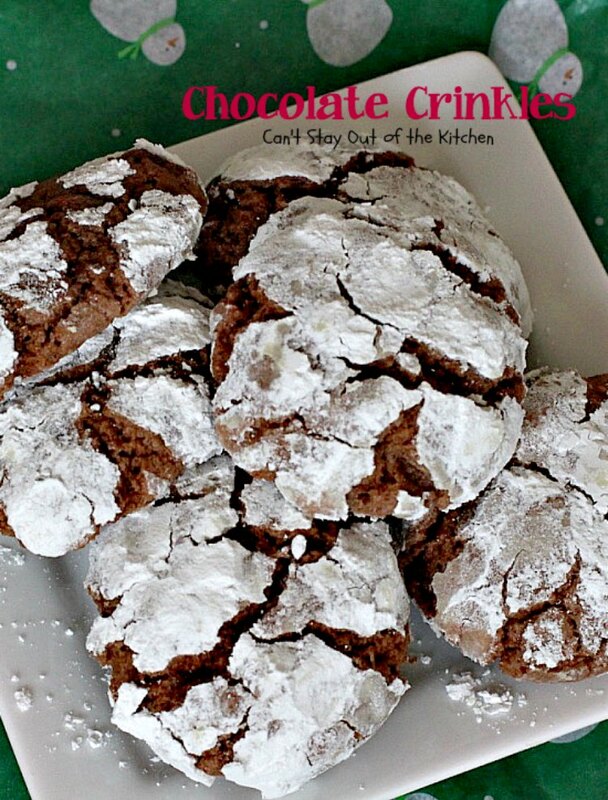 Chocolate Crinkles are to die for! Really! 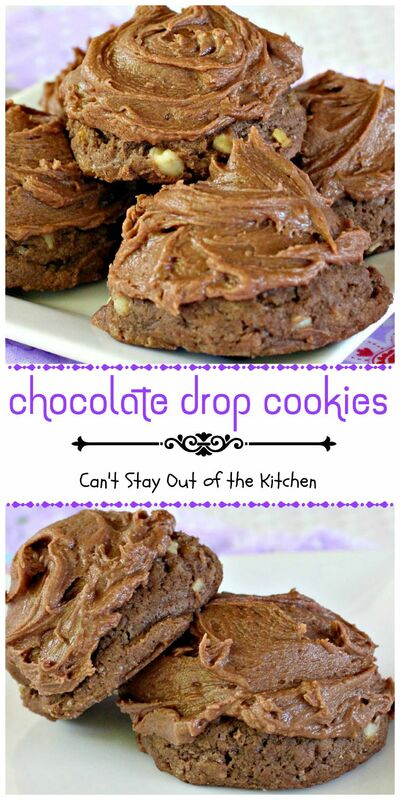 We love these amazing chocolate cookies. There’s lots of wonderful chocolate and powdered sugar in every bite. 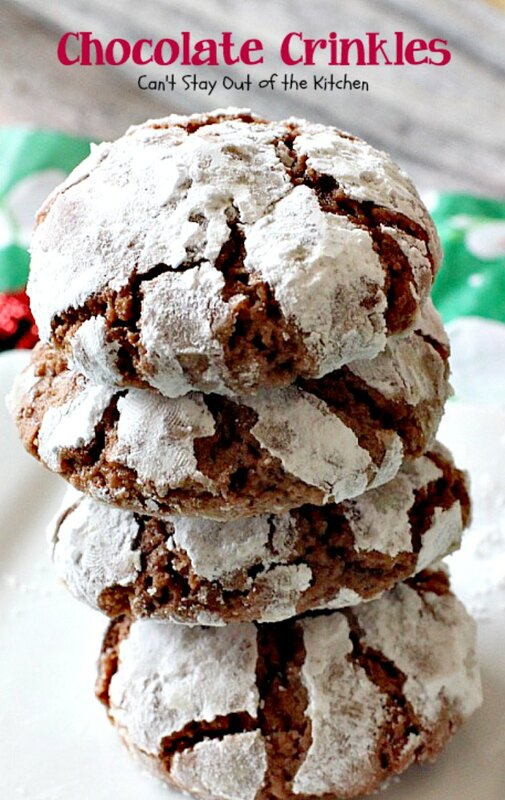 We have baked these cookies for years for our Christmas Cookie Extravaganza because they are so simple and easy to put together, yet so scrumptious to the taste buds. Chocolate Crinkles are a wonderful chocolate cookie made with Ghirardelli unsweetened baking chocolate and rolled in powdered sugar before baking. 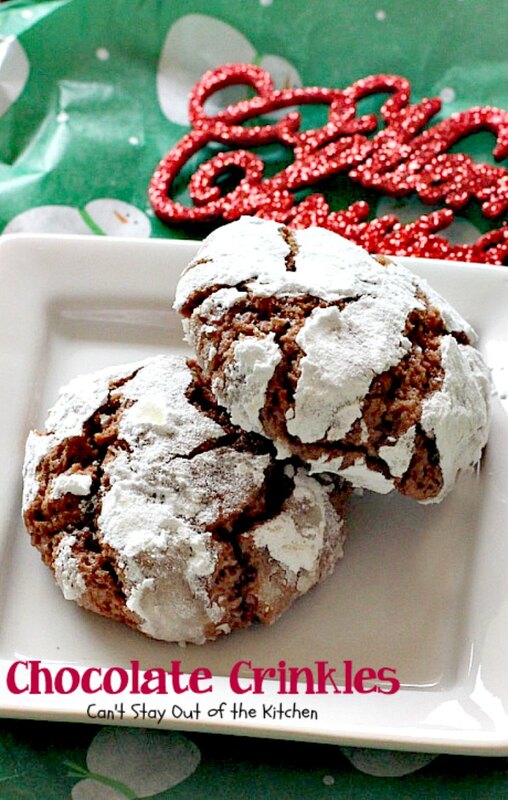 Then when the cookies bake and spread large cracks appear in the cookie distributing the powdered sugar accordingly. They really are a fantastic cookie and fairly easy to make as well. As far as economy goes, except for buying the unsweetened baking chocolate you probably have all the ingredients on hand unless you aren’t a baker. I got this recipe during the Christmas season of 1980 when I was working as a secretary at First Baptist Church of Indian Rocks, in Largo, Florida, and the music minister’s wife, Babs Kelley, brought these fabulous cookies in one day for our office staff to consume. And consume them we did–or should I say inhale them! We scarfed down these cookies in no time and all of the secretaries begged Babs to give us the recipe. She gladly complied. It is imperative that you chill the dough a couple of hours before rolling the dough into balls and then rolling in powdered sugar. Otherwise, the dough will be too sticky, unworkable and the cookies will flatten out too much while baking. Chill the dough at least an hour, but several hours or over night is even better. 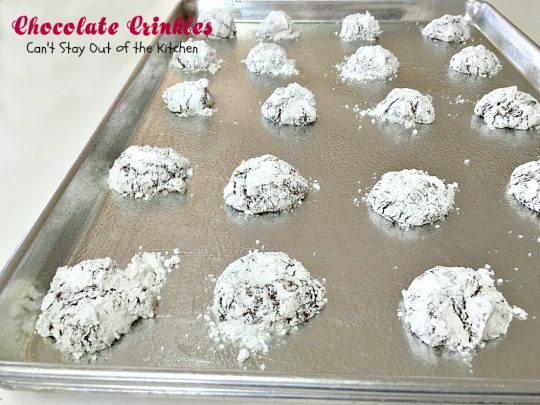 If you want the powdered sugar to be more liberally applied to the cookie and not melt or dissolve into the chocolate while baking, you can refreeze the cookie dough balls before baking. 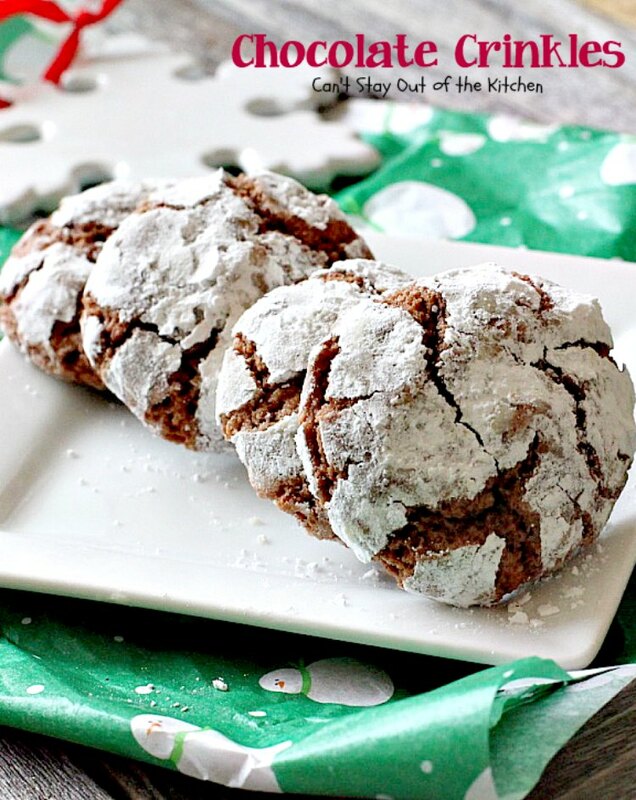 If you’re looking for a quick and easy Christmas cookie to take along to parties or to prepare for your family dinners this spectacular cookie fills the bill. 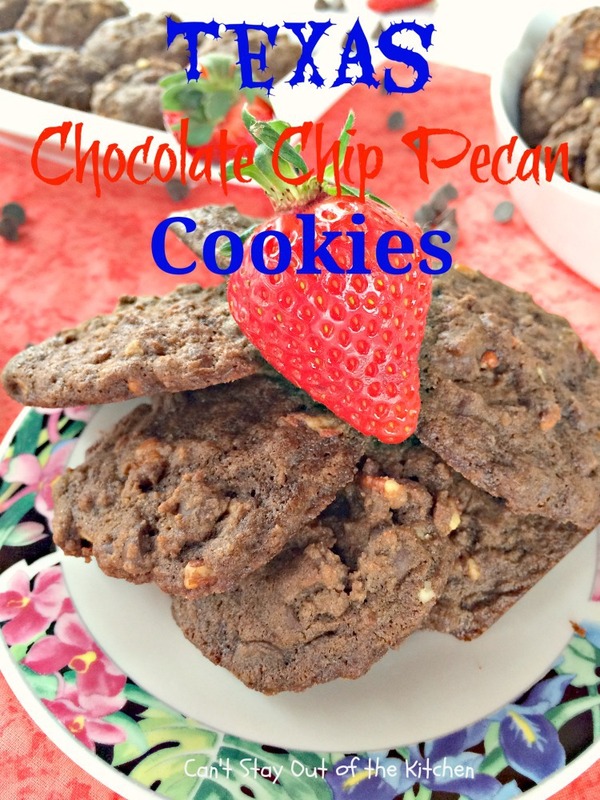 If you’re a chocoholic you will love these cookies. 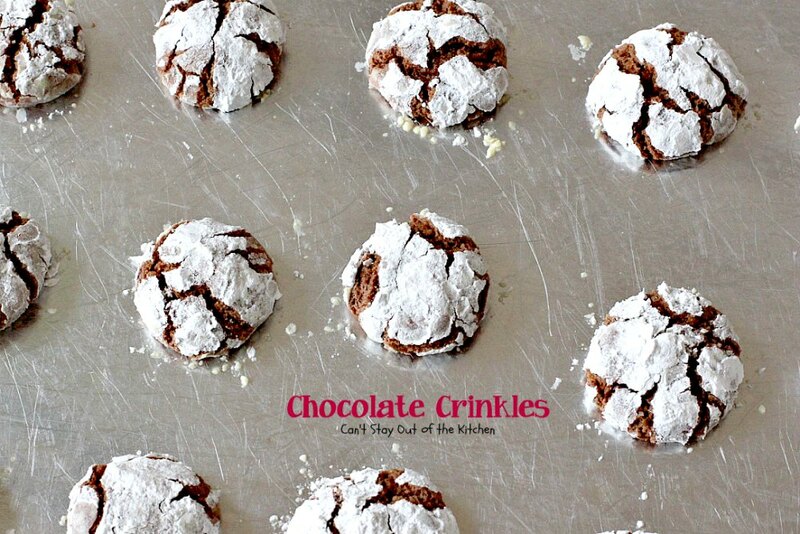 Even if you’re not a chocoholic these cookies are fabulous. 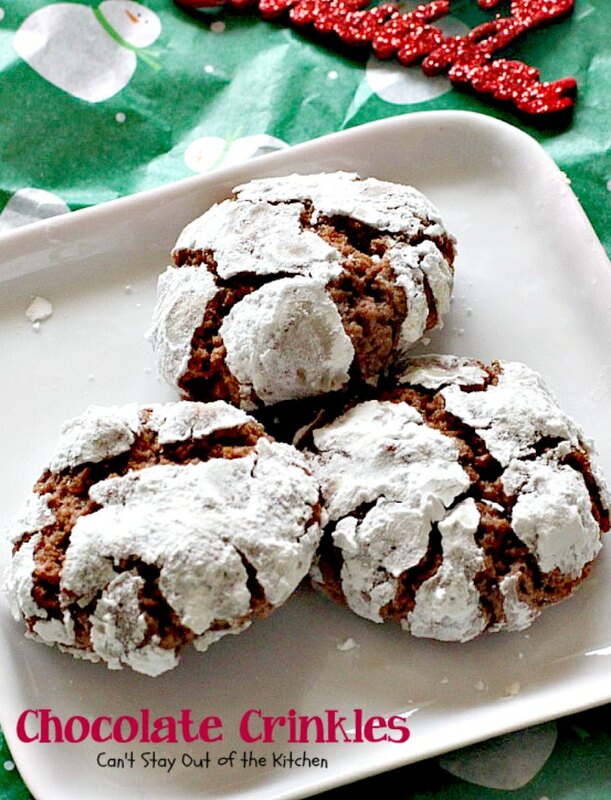 Why don’t you try adding these to your holiday baking list this year? I love having cookies in my repertoire that don’t have to be iced, decorated, or have so many steps that they take all day to bake and be finished! Yet, these come out beautiful in appearance and excellent in taste, texture, and crunchiness. You can also make up the dough the night before, refrigerate overnight, and then make them up the beginning of the next day. We really enjoy Chocolate Crinkles and believe your family will love having these cookies added to their tasty treats to sample this year! Ho! Ho! Ho! Merry Christmas! When I initially posted this recipe in December 2015, I was using an iPhone 3 for a camera and my pictures were deplorable. They were cloudy and unclear, there were way too many Christmas decorations and props, and in general the pictures were not very good even though I tried to present them well. I remade these cookies (January 2016) for John to use as giveaways to friends and snapped a few new pictures while I was at it. I still wasn’t happy with the photographic results. So I again retook the pictures (December 2016) when I was baking them for our Christmas Cookie Extravaganza. Chocolate Crinkles are elegant enough in appearance to take along to Christmas parties, but they sure are great for regular at home desserts and snacks, too. 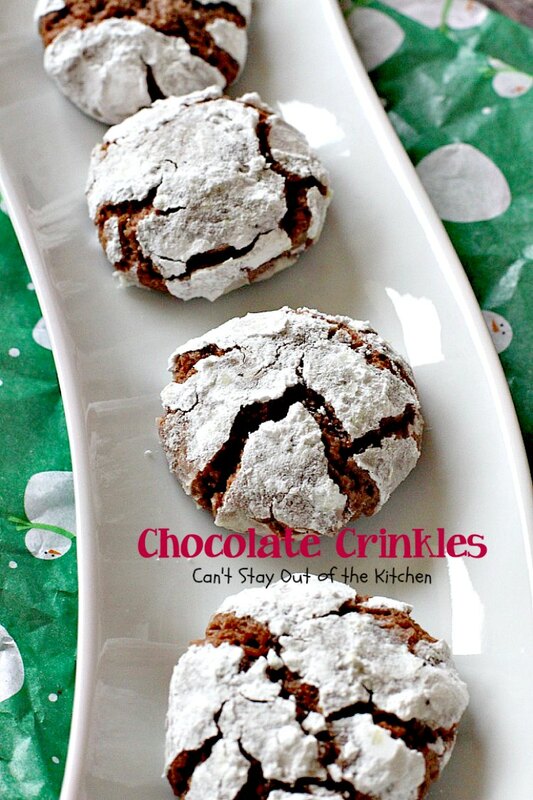 Chocolate Crinkles are also great to offer for special occasions. Bring these along to your office and your coworkers will make short work of them. Before you know it you will blink your eyes and they’re all gone! Your kids will love these tasty treats. Melt chocolate over low heat. Set aside. In a mixing bowl, place granulated sugar, salt, baking powder, eggs, vanilla and oil. 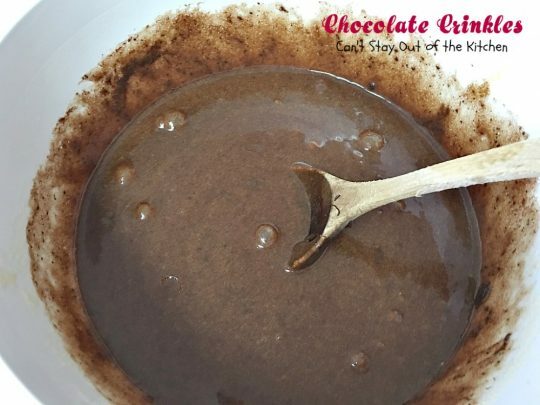 Stir cooled chocolate into mixture with eggs. Add UNBLEACHED all-purpose flour. Bleached flour toughens cookies. Stir with a wooden spoon to combine. Cover and chill dough at least one hour. Three hours or overnight is optimum. Pinch off a small part of the dough and shape into a ball. 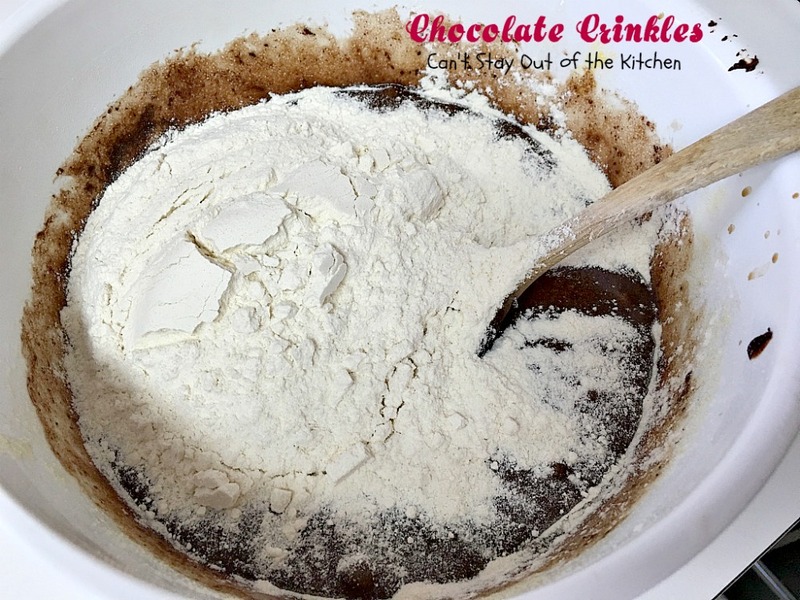 Place ball of dough into a bowl containing the powdered sugar. Roll the chocolate cookie dough into the powdered sugar being sure to cover the ball really well with powdered sugar. Place Chocolate Crinkles on baking sheets that are well coated with cooking spray. Refrigerate the dough another hour if you have time. Bake about 8-10 minutes or until done. Each oven is different. I’ve had these take as long as 16 minutes before they weren’t gooey in the cracks. Here’s a plate of these delicious goodies. Your family will love these amazing goodies. 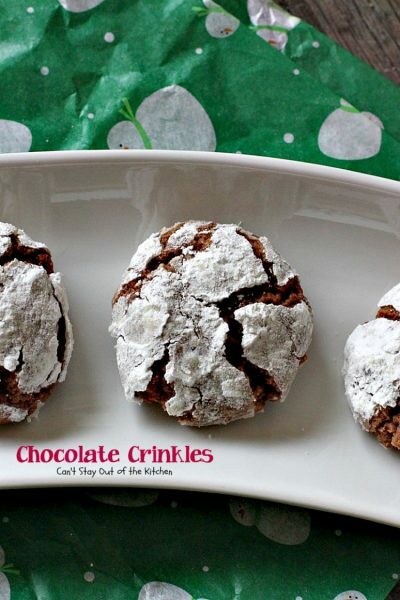 Chocolate Crinkles are really fairly quick to make. Especially if you make the dough the night before and they’re ready to bake first thing the next morning. Wonderful chocolate cookie using Ghirardelli chocolate and rolled in powdered sugar leaving a cracked or crinkled appearance. Great for holiday baking. 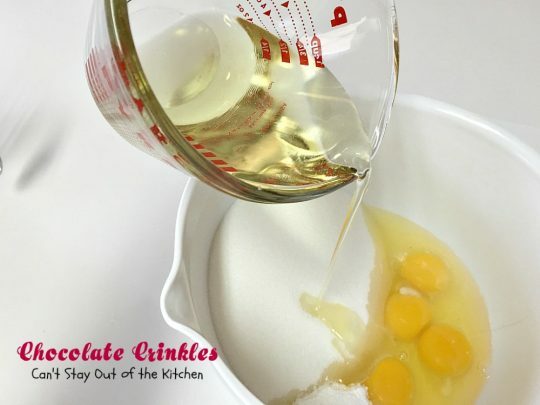 Mix oil, granulated sugar, eggs, vanilla, baking powder and salt. 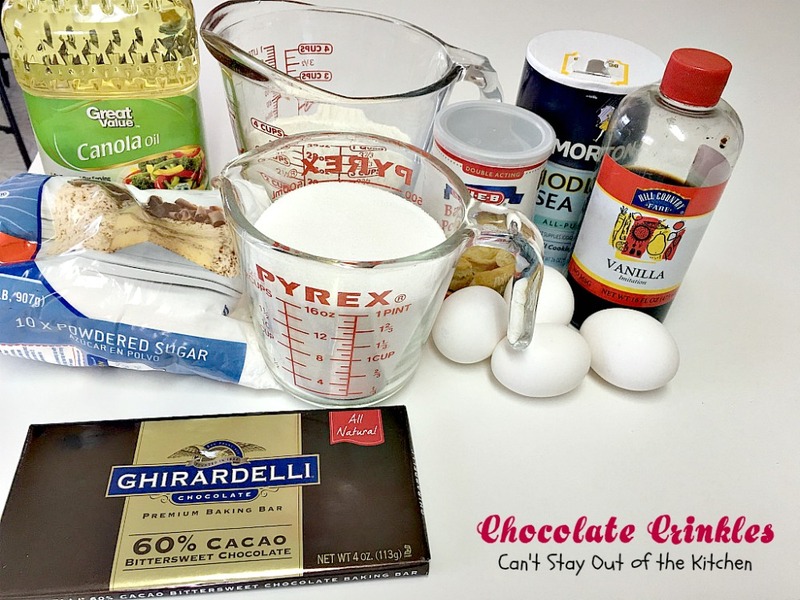 Add chocolate and stir to combine. Stir flour into cookie mixture. Chill a minimum of one hour or several hours or overnight. 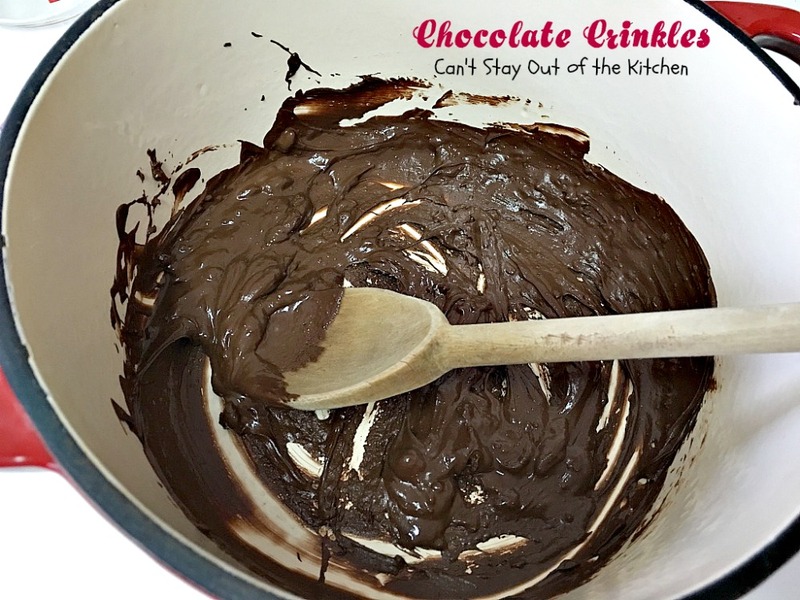 (You must chill this recipe or you will not be able to work the dough). 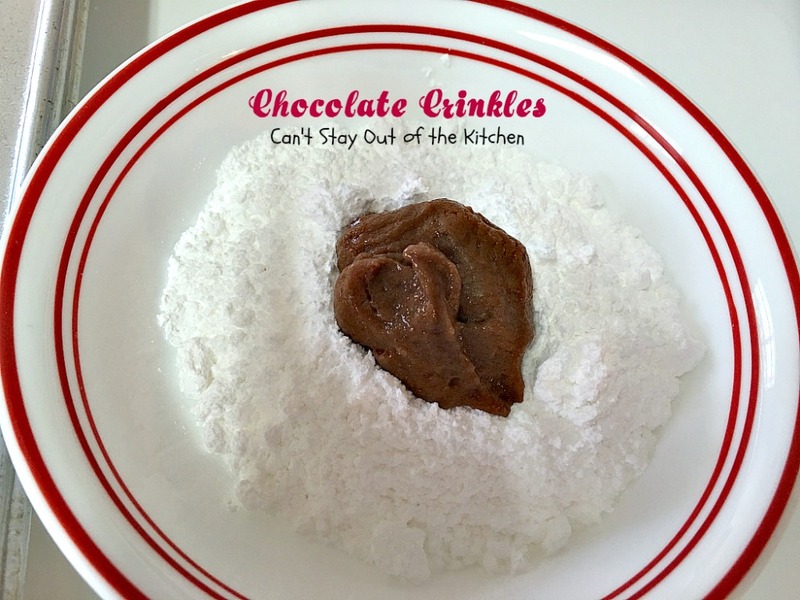 Drop teaspoonfuls of dough into powdered sugar. Roll in sugar; shape into balls. Place about 2” apart on well-greased or well-sprayed cookie sheets. NOTE: You must chill this recipe or you will not be able to work the dough. If you have the time to refrigerate the cookie dough overnight, the cookies will turn out better. NOTE: Preparation time does not include time necessary to chill the dough. NOTE: If you only have time to chill the dough for an hour, then I recommend that you refrigerate the cookies for an additional hour after putting them on the cookie sheets. Then the powdered sugar will not dissolve so much into the cookie and the cookies will not flatten out so much while baking. NOTE: I have also used 4.25-oz. Hershey’s mildly sweetened dark chocolate. NOTE: I have never had these cookies bake in under 15 minutes. But each oven is different. Your oven may bake them more quickly. Wonderful chocolate cookie using [url href=”http://www.ghirardelli.com/” target=”_blank”]Ghirardelli[/url]chocolate and rolled in powdered sugar leaving a cracked or crinkled appearance. Great for holiday baking. Stir flour into cookiel mixture. Place about 2” apart on [u]well-greased[/u] or [u]well-sprayed[/u] cookie sheets. You must chill this recipe or you will not be able to work the dough. [br][br]Preparation time does not include time necessary to chill the dough. 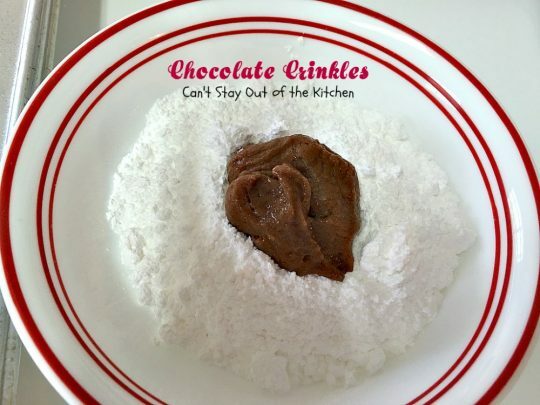 [br][br]If you have time to refrigerate the cookies for an additional hour before baking, the powdered sugar will not dissolve so much into the cookie and the cookies will not flatten out so much. Chocolate Crinkles are also great for tailgating parties in the fall and winter. 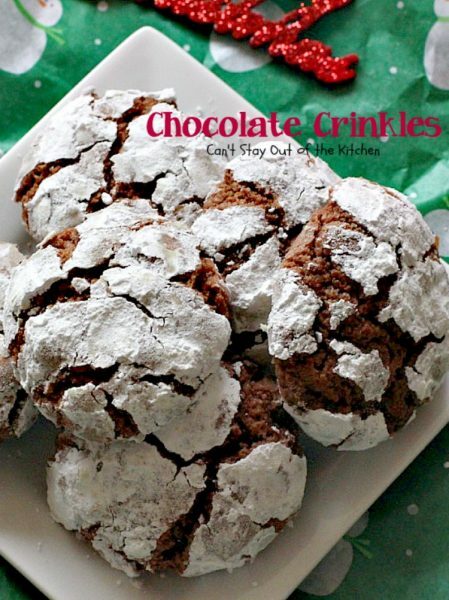 These elegant cookies are great for Christmas Cookie Exchanges or for giving as gifts. It’s really a fudgy type of cookie. Wonderful flavors.